So now... decisions decisions... what to make for dessert. I consult one of my favourite recipe books... Marian Keyes - Saved by the cake. 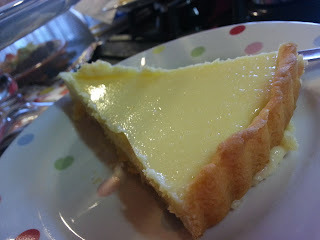 (See blog post on saved by the cake) Therein I found a recipe for Key Lime Pie. I like the sound of it... well... all except for the lime. Im not too crazy about Limes and so decided to switch to lemon instead. Since the tart needs 6 hours to set, I had to be up at 7am to bake the thing so it would be ready in time! (I made sure to make my guests aware of that fact in order for them to truly appreciate and savour each bit! lol). Having made the short crust pastry before when making Mince pies (See battle of the mince pies)... That was easy peasy. I actually made that the night before since it needs to be in the fridge for at least an hour and didn't really want to be up an hour earlier the next day! Having rolled out my pastry I gently lifted it off the counter and gently placed in into the pie tin! Yeah right! Dam pastry is so sort and since it is so hot now in December, the butter in the pastry had started to melt a bit. In the end I used bits of pastry to patch up the holes but... no matter... all worked out in the end... No one knew any different.... ummm... although now I guess I've just told you all! oops! So I have never had to blind bake anything before, since this pie thing is completely new to me. I had bought some beans before... I still dont know if you're supposed to use a specific type of bean??? So forgetting at first to line the pastry with baking paper before I chuck in in the beans, I blind bake the pastry for 15 min. 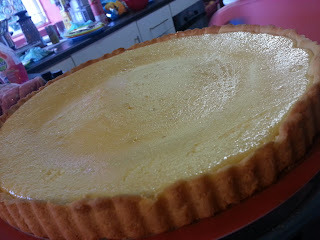 While that is baking away, I make the mixture which is made from egg yolks, condense milk and lemon juice and zest. Once the pastry is done... I poured the mixture into the pan - after taking out the beans! LOL and baked for a further 15min. Once that is done, it cools and then sets in the fridge for 6 hours. My favourite part of this whole thing was removing the casing of the pie dish and my pie DID NOT fall apart! YAY!! All in all, I would say! Good Job! !